As you may have realized, I love meal planning and could talk about it for hours! At least I used to enjoy it. I did and then I didn’t, and now I do again. I know, I know! The busiest season are the times we need meal plans the most, but I just couldn’t do it. We still ate meals, but it was so simple and sometimes really random and sometimes it was take-out…I know, ewwww, but hey, I didn’t have to cook! Meals were random because I didn’t plan and because I didn’t create a proper shopping list to go with a plan. It has always been a bit of a process for me, hauling out all my cookbooks and recipes and trying to come up with something creative and new for every meal. I just go tired of trying to come up with ideas and wished we could take a break from eating for a while. Taking a break from meal planning ended up being a great thing because it reminded me of why I do love it so much and why it is so important to keeping my family fed. Now that we are back in to Fall routine, it is vital that I continue to meal plan, but this time around I decided to try something different and to simplify by just planning for dinners. Breakfasts and lunch items are pretty much always on the shopping list, so I don’t have to plan for those as much. Plus, my bigger kids are at the age where they take turns making breakfast and lunch. This weekend I decided to meal plan a little differently and I am glad I did! I grabbed my stop watch, my family favourites list and a blank meal planning calendar. Once I had the “theme” for each day of the week I started the stop watch and wrote down 4 meal ideas for each “theme”. And then I moved on to the next day/meal theme and wrote down 4 more ideas. And so on, working my way through each day of the week. 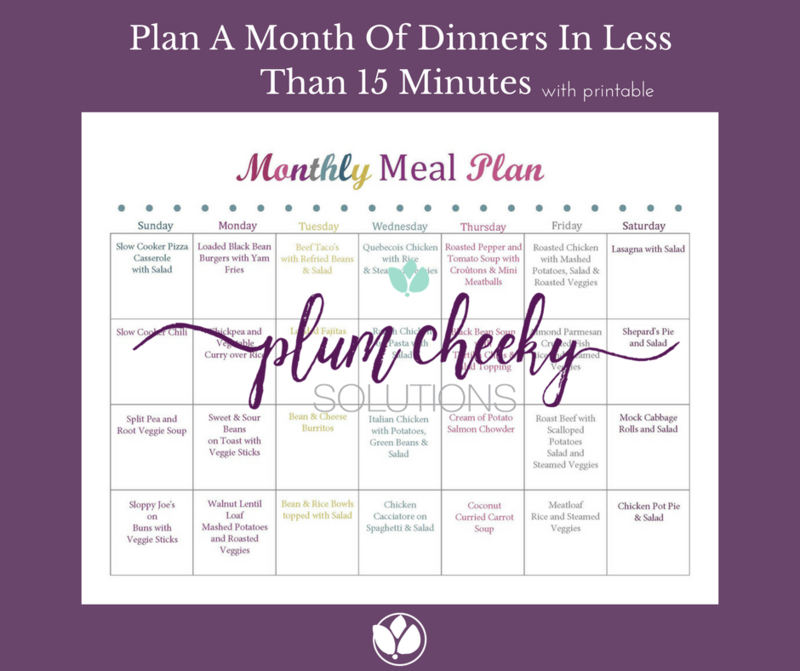 It was such a quick process and I was able to plan 28 dinner meals in under 15 minutes…probably closer to 10 because of all the interruptions I had! That was a record for me and got me excited about meal planning again! Yay! Sometimes all we need is to simplify and a little inspiration, so I thought I would post my October dinner meal plan (click here for printable meal plan) to give you some dinner ideas for the month.